In this article we will go through the most commonly used microcontrollers and Digital Signal Processors (DSP) for high temperature applications from 150°C and upwards. This article will not discuss all processor alternatives, but focus on the most common and relevant options. Also, this article does not cover processors available in die form, often referred to as «known good die» (KGD), as this product group is usually avoided as it complicates product manufacturing considerably. Texas Instruments OMAPL137-HT processor in a downhole modem rated for 175°C. Most high temperature processors are based on old architectures. Often, an old architecture is taken as a starting point and improved in regards to temperature. The documentation is then updated to some extent, but the documentation can vary quite in quality depending on the manufacturer. 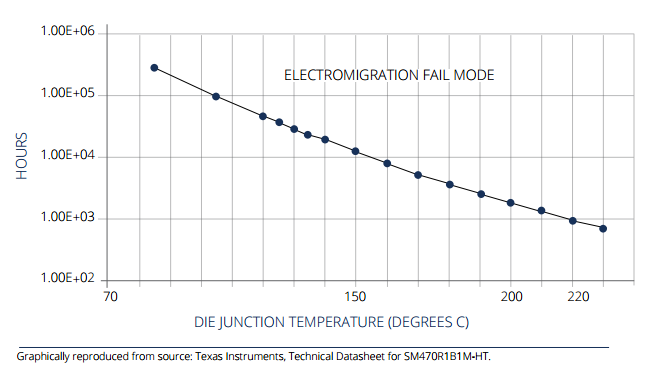 High temperature processors are not necessarily supported in the manufacturer’s tool set. For instance, Texas Instrument (TI) do not recommend their own Code Composer Studio IDE if developing for their SM470 high temperature microcontroller. Instead, TI recommend Embedded Workbench from IAR Systems. In the last few years some companies have been moving towards current microcontroller architectures, specifically ARM Cortex-M. Vorago Technologies has developed a device with a CortexM0 core. Another company, e2v, provides a device with a Cortex-M4 core. BY: Henning Sjurseth Senior Development Engineer Data Respons In general, with higher temperatures device cost goes up and level of functionality goes down. In particular, 150°C degrees devices can be very affordable, but when your design requirement passes 150°C degrees you’ll see a significant price jump. Don’t be surprised if your production cost multiplies by a factor of 5 to 10. In the 150°C degree temperature range, there’s several processor alternatives. As mentioned, e2v is focusing on the ARM Cortex-M4 architecture. Currently e2v have a device rated at 150°C degrees for 1000 hours based on a Freescale microcontroller. The device has both Analog-to-Digital and Digital-to-Analog converters. e2v are hoping to secure development funding to extend the temperature rating for this device to 175°C. Texas Instruments (TI) lineup includes three devices in this temperature range all with plastic packaging: SM470R1B1M-HT, SM320F28335-HT and MSP430F2619S-HT. The first two are also available in a ceramic package for higher temperatures. The first device, SM470R1B1M-HT is a microcontroller with an ARM7TDMI core (32-bit). This device has an Analogto-Digital converter, but no Digital-toAnalog converter. Recommended development tools are from IAR Systems: Embedded Workbench and I-jet debug probe. 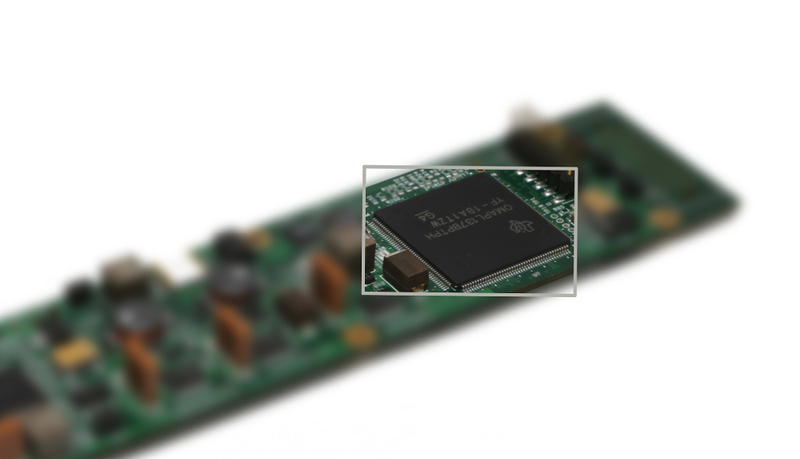 The second device, SM320F28335-HT is a 32-bit DSP with Analog-to-Digital converter. Recommended development tools are TI Code Composer Studio v6 (based on Eclipse) and TI XDS100/200/560 debug probe. The third and last device is MSP430F2619SHT, a 16-bit microcontroller architecture with Analog-to-Digital and Digital-ToAnalog converters. Suggested development tools are Code Composer Studio v6 and TI MSP-FET debug probe. Atmel has several devices based on their 8-bit AVR architecture for applications up to 150°C. These devices also have Analog-to-Digital and Digital-To-Analog converters. Suggested development tools are Atmel Studio IDE (based on Microsoft Visual Studio) and Atmel-ICE or AVR ONE! debug probes. Microchip provides devices for this temperature based on 8- and 16-bit architectures. Their 8-bit architecture devices for 150°C can be found in the PIC12, PIC16 and PIC18 families and their 16-bit architecture devices for 150°C is part of the PIC32 and dsPIC33 families. Recommended development tools are MPLAB X IDE (based on the NetBeans IDE), XC8 (8-bit) or XC16 (16-bit) compiler and MPLAB ICD 3 or REAL ICE debug probe. Texas Instruments provides one device for this temperature, the OMAPL137-HT. This is a dual-core device with one ARM core and one DSP core. This is one of very few devices device suitable for embedded Linux. Recommended development tools are TI Code Composer Studio v6 IDE and TI XDS100/200/560 debug probe. This device doesn’t have an onboard flash for the application image. If you decide to boot the DSP from an external flash, it’s important to note that TI’s own high temperature flash is not compatible. We’ve used TTSemiconductor TTZ2564 flash for booting the application image with the OMAPL137 with no issues. A quick tip, if you have issues booting, check the BOOTCFG register during debug which contain the state of the boot configuration pins during booting. This can be an issue as the boot pins are often used for other functions, such as SPI, after booting. For this range, Texas Instruments offers 3 devices with ceramic packaging. These parts are rated for 210-220°C for 1000 hours. A common use for these are in equipment for downhole oil well services. They are obviously not suited for permanent downhole installation at this temperature. Two of these devices, SM470R1B1M-HT and SM320F28335-HT, are also available in plastic packaging rated for 150°C and are described earlier in this article. There are a few development kits that uses the SM470R1B1M-HT with ceramic packaging. The one typically used is the SM470 development kit manufactured by IAR available for 470 euros. No temperature testing can be performed with this kit as the microcontroller is the only part rated for temperature. This kit also includes an IAR J-Link Lite debug probe. Texas Instruments do not provide an affordable development kit for this part or the equivalent non-high temperature part. The only offer from TI is the HEATEVM development kit at 5749 USD. This kit can be used for evaluating the SM470 (in ceramic packaging) microcontroller, EXTREME CONDITIONS but also several other TI high temperature parts such as operational amplifiers, ADC and transceivers. The kit can be used for high temperature testing. The TI device not discussed previously is the SM320F2812-HT. This is a 32-bit DSP with Analog-to-Digital converter. Recommended development tools for this device are TI Code Composer Studio v6 and TI XDS100/200/560 debug probe. Vorago Technologies, former Silicon Space Technologies, has developed a microcontroller with an ARM Cortex-M0 core. The device, PA32KASA, is rated to 200°C for 1000 hours, but it has survived testing at 250°C for 2500 hours. Note that this device is quite large physically compared to other microcontrollers. Processors operating beyond 200°C are not in frequent use, but there are some options. One is Honeywell’s HT83C51 8-bit microcontroller. It is designed for 225°C operation. However, Honeywell claims «… parts will operate up to 300°C for a year, with derated performance». Tekmos also provides alternatives, the TK8xH51x family. It is designed for 250°C and this is also an 8-bit architecture. Frequently, high temperature parts are specified for 1000 hours at certain temperature. If this lifetime is not sufficient for you application, you can select a device rated at a higher temperature as it will survive longer at a lower temperature. The figure above shows the lifetime for TI SM470R1B1M-HT in ceramic packaging dependent on temperature. For 220°C, the device lifetime is 1 000 hours (1 month, 10 days), at 175°C lifetime is 4 000 hours (5.5 months), at 150°C lifetime is 12 000 hours (1 year, 4 months) and at 125°C lifetime is 40 000 hours (4.5 years). In conclusion, during specification gathering pay particular attention to the temperature requirement of you application. If the temperature requirement can be reduced, you’ll benefit from significant production cost savings. Development efforts are also significantly affected by the temperature requirement and this mainly affects the hardware development. The driving factors are time consuming temperature testing and documentation that is very limited specifying performance at maximum temperature. If this is your first high temperature design, keep in mind that the tool support and documentation might not be at the same level as for non-high temperature processors. As always, discuss your application with others engineers with relevant experience.